Visit the New Bedford Whaling Museum. Visit the Rotch-Jones-Duff House and Garden Museum. Explore the New Bedford Museum of Glass. See what's happening at the New Bedford Art Museum. Learn more at the New Bedford Whaling National Historical Park. 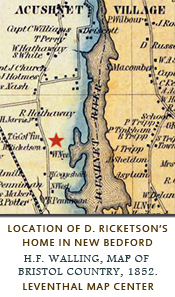 Although Thoreau lectured only once in New Bedford, he traveled here relatively frequently to visit his close friend Daniel Ricketson. The two met in December 1854 after Ricketson wrote to say how much he had enjoyed reading Walden. Thoreau was slow to respond at first, but after he recognized their mutual interest in natural history, philosophy, and poetry, he agreed to come to Brooklawn, Ricketson's home in New Bedford, on his way to give a talk in Nantucket. One of the many reasons why Ricketson took such an immediate liking to Walden, which was, no doubt, also a factor in the unusually close relationship the two developed, was that Ricketson had several years earlier built what he called his "Shanty." This hut stood a short distance from his house at Brooklawn and, even though it was a bit less remote than Thoreau's cabin, it served a similar purpose as a place for reflection, writing, and watching the progress of the seasons. In the latter part of the afternoon...I saw a man walking up the carriage road, bearing a portmanteau in one hand and an umbrella in the other. He was dressed in a long overcoat of dark cloth and wore a dark soft hat...It flashed at once in my mind that the person before me was my correspondent, whom in my imagination I had figured as stout and robust, instead of the small and rather inferior looking man before me...The most expressive feature of his face was his eye, blue in color and full of the greatest humanity and intelligence... In Thoreau, as in other heroic men, it was the spirit more than the temple in which it dwelt, that made the man." On his subsequent visits to New Bedford, Thoreau studied the area extensively, following in this case, as in many others, the model of Samuel Champlain,whose work he admired, as he wrote Cape Cod, because it included such a broad array of "information, geographical, ethnographical, zoological, and botanical." 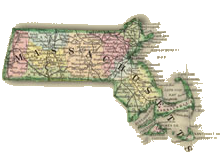 In 1855, for example, he traced a map of the nearby town of Middleborough to aid his exploration of the ponds and other natural features of the region. He also consulted, as he often did on various expeditions, the Massachusetts Historical Collections, copying into his journal local legends and anecdotes such as the story of a turtle first found and marked in Middleborough in 1747, then found and dated five more times before it was last seen in 1791. 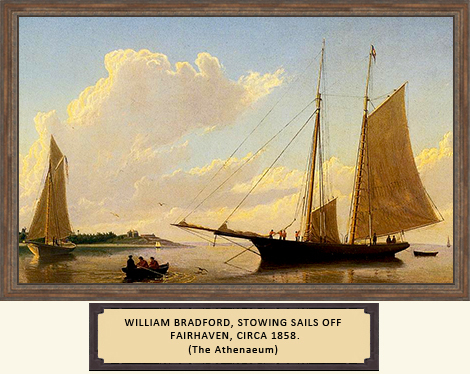 With his usual determination to seek out whomever might be most interesting everywhere he went, he walked from Ricketson's to Fairhaven to visit the studio of William Bradford, later recognized as one of the world's most accomplished marine painters. As it turned out, Bradford was away, but Thoreau did meet Dutch artist Albert Van Beest, Bradford's mentor, who was at that time more well known than his soon-to-be famous student. Ricketson also visited Thoreau in Concord, stopping there sometimes after attending anti-slavery meetings in Boston. A committed Quaker, Ricketson never promoted any violent action even to end slavery, but he carried on the progressive tradition of New Bedford by arranging anti-slavery lectures at the local lyceum and writing for the Liberator, along with other anti-slavery journals. He also wrote a history of the town that included a detailed chapter on the "Early and Continued Anti-Slavery Character of New Bedford," in which he proudly summarized the local devotion to principles of equality by recalling that the "passage of the odious "Fugitive Slave Bill" was received here...with an almost universal contempt; and it is thought that the rendition of a fugitive from our city could not be effected." "Until a few weeks since I did not know that Henry had his picture taken when in New Bedford last; he accidentally spoke of it, and said that you considered it a good likeness. None of his daguerreotypes have pleased us, and I did not imagine that the ambrotype would afford us much satisfaction...I need not tell you, for I cannot, how agreeably surprised I was on opening the little box, to find my own lost brother again. I could not restrain my tears. I discover a slight shade about the eyes expressive of weariness, but a stranger might not observe it. 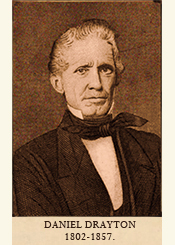 I am very glad to possess a picture of so late a date...Mr. Channing, Emerson, Alcott, and many other friends who have looked at the ambrotype express much satisfaction." 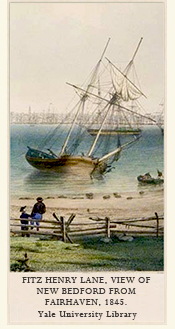 Read "The Imprint of the Past: the Ecological History of New Bedford Harbor," a publication of the EPA. 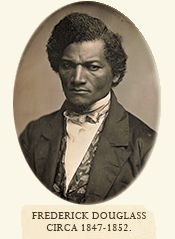 Read Frederick Douglass's account of his life in New Bedford after his escape from slavery in Maryland. 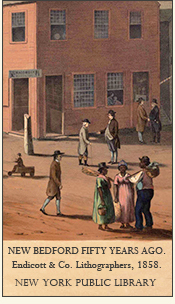 Read the memoir of New Bedford abolitionist Daniel Drayton, who spent "four years and four months a prisoner (for charity's sake) in Washington jail." 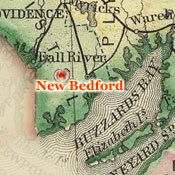 Read Daniel Ricketson's History of New Bedford. 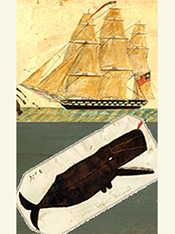 Read about Herman Melville's departure from New Bedford on the whaleship Acushnet in 1841.